It’s rare you see a movie you love so much that you want to go straight back in the cinema and see it again. 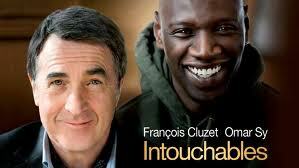 But that’s exactly how I felt about The Intouchables. It’s a film that’s hard to fault on any level. I’m just surprised we haven’t heard more HYPE about it, because since March, it became the became the highest-grossing non-English language film yet released. But perhaps that’s another reason why I loved this film so much. Without being exposed to the usual fan-fare that precedes a much-touted Hollywood block-buster, I had no preconditioned expectations. When people hear the movie is French, a common reaction is ‘Oh no, I have to read sub-titles!’ But believe me, minutes into the film, you won’t even notice them. It’s the first movie I’ve really wanted to talk about in a Blog but having decided to do that, I’ve found it’s also a difficult film to review without giving away too much of the plot. There are several surprises throughout and I don’t want to spoil it for you. Even when the movie opens, it leads you to believe you are about to see a particular genre – perhaps a cops and robbers tale – but then neatly twists into something altogether. Much of the story is told as a flash-back. In basic terms, it’s a story about a beautiful friendship between two men. 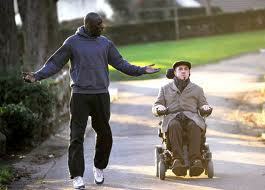 Phillipe (Francois Cluzet), is a wealthy quadriplegic, looking to hire a new carer. 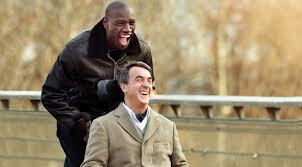 Along comes Driss (Omar Sy) from the ghetto who isn’t looking for a job – merely a signature on a form to show he turned up to the interview, to help ensure he receives his welfare benefits. And then the humour kicks in and the film surprises again by revealing itself as a comedy with bucket-loads of laughs. These two main characters are endearing to the core, and because they come from complete opposites of the social spectrum, the charm of this unique bonding is given added strength. Phillipe exposes Driss to a world of culture and luxury he’d never imagined, while Driss brings light, spontaneity and feeling to Phillipe’s life. Driss has a naive appeal that brings out the best in Phillipe and forces him to acknowledge emotions he has locked away for a long time. They seem to have a natural affinity that goes beyond race and social status – a connection that translates iridescently onto the screen. It’s like they both discover something they both desperately need, but until that moment, never knew how much they needed it. Much of what happens strikes a deeper chord because we aren’t given the usual musical or visual triggers that spell out something is about to happen! in a standard Hollywood flick. How wonderful to see a movie where these moments speak for themselves. Ultimately, it’s the emotional sincerity of the story and the performances that put this movie above the rest. When the dialogue is minimal and natural, and the actors depth of emotion accurately reflects so much subtext, it makes for a more genuine experience. We are all the more richer for absorbing a film with such extraordinary layers – a film that will leave you with a lasting memory about the human condition.